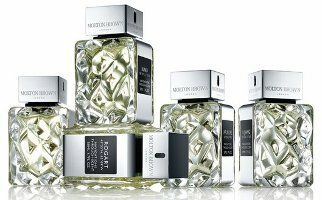 Molton Brown will launch Navigations Through Scent, a new quintet of unisex fragrances, in September. The fragrances were developed by perfumer Jennifer Jambon and inspired by countries along the spice route. Iunu ~ a spicy floriental inspired by Egypt and featuring jasmine. $120. Lijiang ~ a fruity floral inspired by China and featuring osmanthus. $120. Singosari ~ a spicy woods inspired by Indonesia and featuring patchouli. $100. Apuldre ~ a green aromatic inspired by England and featuring juniper berry. $100. Rogart ~ a woody fresh scent inspired by Canada and featuring fir balsam. $110. Five. Five at once…because we desperately needed 5 more at once. I’m finding this tactic increasingly annoying…..it’s like they are trying to throw a perfume net over the consuming public…..”we’ll catch more of them with this bigger net…..” It really does seem like being hit over the head. In self defense; I’ll ignore all of them. Ditto. Wish they’d do one at a time. Canada is along the spice route? England I can kind of understand (if I stretch until it hurts) as the final destination of spice route traders…but Canada? …more summer construction…there was a detour…. Guessing they just wanted to add the “New World”. Maybe some of the spice traders took a wrong turn and ended up in Canada, eh? The fragrance should smell like a mix of Canadian hockey player sweat, Tim Horton’s coffee, and maple syrup. Sorta, but I find it different enough. Similar, but more elegant, perhaps? I think it is more Histoires des Parfums meets Les Escales of Christian Dior. I like them. That’s what caught me to this post. Molton Brown has been a very disappointing brand for me. Touted as a niche/luxury brand and yet every product I’ve tried can only be described as “weak”. I’m with Daisy. I won’t even bother. I agree, scent-wise (most of their stuff I’d classify as pleasant bath products) but will try these if I see them…looks like they’re trying to break into a new market, and you never know. The first three sound interesting. My only experience with MB is their bath products. I’ve been hooked on their Suma Ginseng bath and shower liquid for many years. They call it “invigorating” and I agree. I’ve never been able to get hold of samples directly from them as they said I’d have to come to London. I think The Perfumed Court might carry them. Anyway, they’ve got quite a few other bath products I’d like to sample, and now these fragrances have caught my attention. If anyone gets to sniff them, please post here. Oh dear, Robin: I read this as “peasant bath products” – hah! LOL …not at those prices! And they all cost more than their existing men’s fragrances. The simultaneous release of five high-priced fragrances is a neat trick from an economics standpoint – you realize significant economies of scale by doing five at once, but you charge more for each of them than you do for your existing fragrances! Since they’re “unisex” (thought I can’t a guy wearing a “fruity floral”) the market is, at least theoretically, infinite. Lot’s of people think the motion picture industry went straight to h*ll when the accountants took over…looks like the same thing is happening in the fragrance industry. They cost much more. If they’re not good, it will really all be quite silly. I’ve tried all of these and some are surprisingly good. My favourite is the floriental Iunu and Rogart. Rogart to me is a much more wearable take on Serge Lutens Chypre Rouge. Maple Syrup is beautifully combined with fir balm and the effect is quite lovely in a hot/cold way.